Carpenter ant galleries are very smooth inside, with an almost sandpapered appearance. The smooth galleries are one way to distinguish carpenter ant damage from damage caused by termites or wood-devouring beetles. Carpenter ant galleries are also very clean inside, whereas termite galleries typically have mud and dirt in them. The only things you'll typically find inside a carpenter ant gallery are the ants themselves, their eggs, and possibly a bit of sawdust that hasn't been swept out yet. The sawdust itself is another thing to look for. Exterminators call it "frass," and the carpenter ants constantly sweep it out of the galleries as they excavate. It's fairly coarse sawdust and can often be found on the floor under or adjacent to an active carpenter ant gallery. The absence of frass, however, doesn't mean that you don't have carpenter ants. They might be expelling it on a hidden side of the timber, for example, inside a wall void. Another thing to bear in mind is that carpenter ants excavate galleries inside the wood. The outside may still be intact on the side facing you, or there may be only "windows" through which the ants sweep out the sawdust and travel to and from their foraging areas. Also, the moisture-damaged part of the wood that the ants prefer to infest may be side that's hidden from you, especially in the case of sill plates and roof timbers. The most obvious sign that you have a carpenter ant problem, of course, is if you see the ants themselves. Carpenter ants can be most rapidly distinguished from termites by their hourglass-shaped bodies and constricted "wasp" waists. Termites, on the other hand, have cigar-shaped bodies. Another thing to look for is mud shelter tubes. 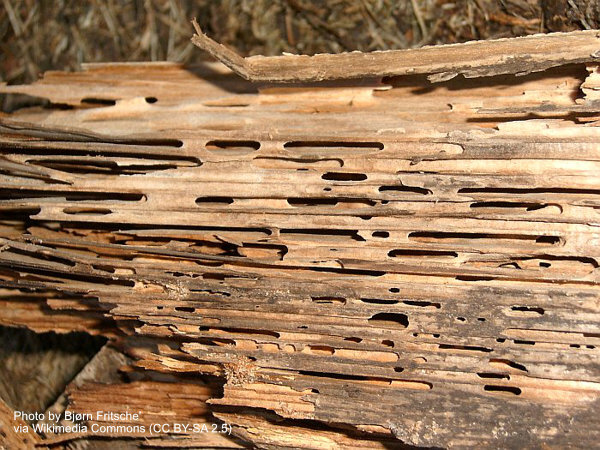 Subterranean termites travel to and from the wood in shelter tubes made of mud, but carpenter ants travel exposed. If you see shelter tubes, then you either have or once had a termite problem. Scrape the shelter tubes off. If there are no termite workers inside, then it's an old, presently-inactive infestation. If there are, then it's an active termite infestation. Carpenter ants and termites won't infest the same piece of wood at the same time. 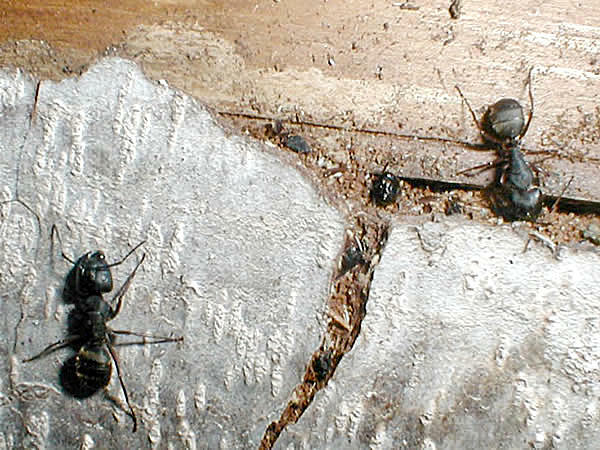 Carpenter ants eat termites, and the termites tend to take offense. But it's not unusual for carpenter ants to infest a piece of wood that termites fed on in the past. Here's why. Old-school subterranean termite treatments used "chemical barriers" like chlordane in the soil around the house that prevented the termites from traveling from their underground nests to the wood they were feeding on. It was unusual to treat the wood itself. If the damage was severe, the wood would be replaced. If not, it was left alone. The termites lived in the soil, not the wood; so strictly speaking, there was no need to directly treat the wood in most cases. Because the chemicals used for termite control back then were both very repellant and fast-acting, termites tended to avoid the treated areas; and those who did contact the termiticide usually died pretty quickly. It's therefore possible for a timber that termites once were feeding on to have little or no trace of the termiticide that was used in the soil to treat the termites, and to be re-infested with carpenter ants. If you have inactive termite shelter tubes and live carpenter ants, then that's probably what happened. The roof, especially near the eaves if the house has rain gutters that may have backed up into the roof. The sill plate (the wooden timber upon which the first-floor studs rest). Inside door and window frames. In any walls containing water pipes or adjacent to kitchen, bathroom, or laundry room fixtures. It also makes sense to start with the locations nearest where the ants are most commonly seen. For example, if you're seeing more ants on the top floor, then it's likely (but not certain) that the nest is also located in a higher part of the house. Also pay close attention to any part of the house that tree branches touch or overhang. Carpenter ants often climb trees to get into homes. It's also possible that the nest itself is in the tree, and the ants you see in the house are foragers. Finally, remember that ants carry food are returning to the nest; so if you see an ant carry a bit of what would pass for food if you were an ant, follow it. It may just lead you to the nest. How Big a Problem is Carpenter Ant Damage? In a sense, a carpenter ant infestation should be viewed as a symptom as much as a problem in its own right. Carpenter ants almost always nest in wood that has been water-damaged, so a carpenter ant problem is a symptom that water is getting into your house somewhere. The water is likely to do more damage, and to do it more quickly, than the carpenter ants. 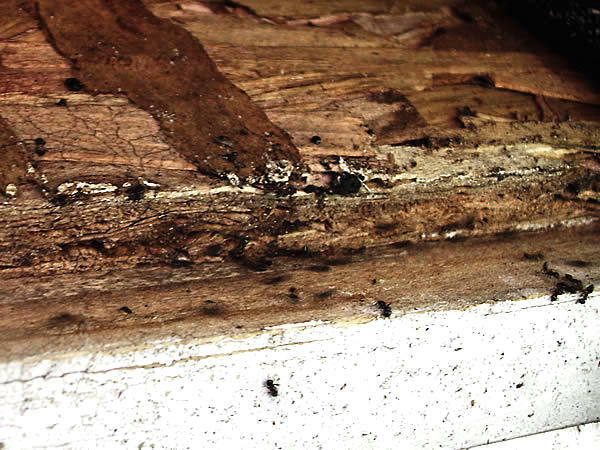 In other words, when assessing the damage caused by carpenter ants to homes and other structures, we have to consider that the wood, in all likelihood, already had considerable moisture damage long before the carpenter ants arrived. The practical take-away is that if you have carpenter ants, you need to think in terms of fixing the problem that's causing water to get into the house, if it hasn't already been fixed. Ideally, this should be done before you treat the carpenter ant problem. Water and microbes can rapidly degrade the effectiveness of many insecticides, so fixing the damage and letting the area dry out before treating it is a much better plan than trying to treat a carpenter ant nest while it's still damp.